Keep Us Trotting and Pacing! For almost two centuries people have enjoyed watching harness racing in the center of the Village of Goshen at Historic Track. As you may be aware, on August 23, 2017, a terrible fire completely destroyed the quaint blacksmith shop, the historic BOCES Barn and the shedrow barn between them. Goshen Historic Track and the Harness Racing Museum & Hall of Fame are jointly raising funds to reconstruct the BOCES Barn. The Track and the Museum have retained the architectural and engineering services of LAN Associates to assist in the planning and rebuilding process. 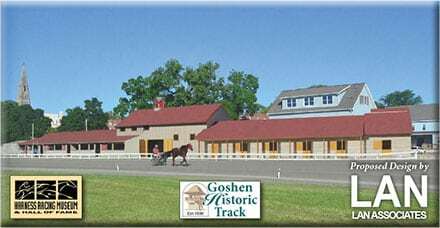 Goshen Historic Track is a Registered Historic Landmark and we have received approval to rebuild the BOCES barn in a manner that will allow it to safely house many of the Museum’s artifacts while simultaneously preserving the structure’s original character. We are Facing a Challenge and Need YOUR Support! The cost of this rebuilding endeavor exceeds proceeds from our insurance coverage, income and donations to date. However, thanks to a generous supporter, we have been given a challenge grant of $80,000. The grant provides that Goshen Historic Track will receive $80,000 if it is able to raise a like sum this year. All funds collected in excess of $80,000 will go toward the relocation of the blacksmith shop and renovation of the Arden Barn. We are calling upon concerned fans, industry stake holders and community leaders to assist us in restoring this historic structure. If you would prefer to write out a check, rather than use PayPal or your preferred credit card, you may also mail your check to Historic Track, 44 Park Place, Goshen, NY 10924. Both Goshen Historic Track and the Harness Racing Museum are 501c3 corporations; all donations for this project are tax deductible. It is our intention to acknowledge and thank all contributors at a function at the Harness Racing Museum at a date to be announced. On behalf of Goshen Historic Track and the Harness Racing Museum, thank you for your generosity. Any amount will be greatly appreciated. Goshen Historic Track is a 501C3 non-profit. Your donation will be tax deductible.